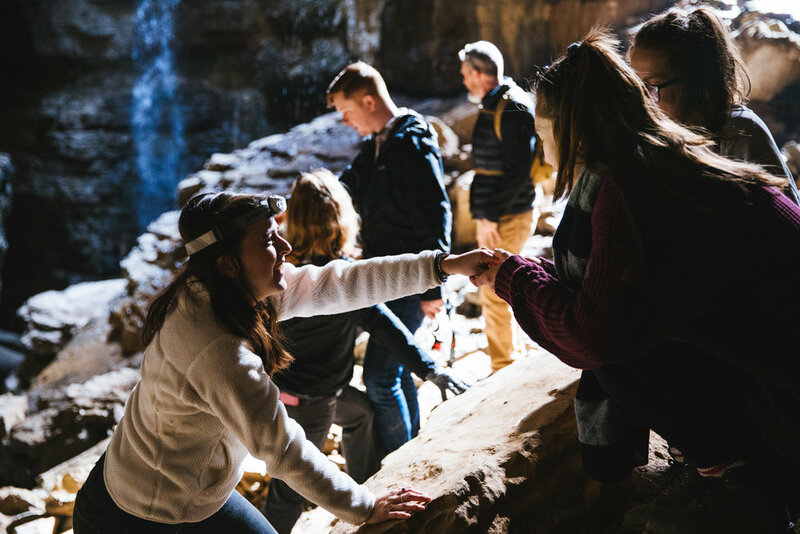 Tom and Laura | Huntsville, Alabama Stephen's Gap Cave Proposal — Jesse and Lex Wedding Co.
Lex and Laura go way back! All the way back to UNF in 2011, when the two met online through a photography community and met up on campus for an impromptu photo shoot. Many fun photos later and the two became good friends! Fast forward years and years, and Laura is now in Gainesville at UF studying to be a veterinarian. In September of 2018 we received an email from her boyfriend Tom saying “Hey guys! I want to propose to Laura in a cave in Alabama in spring of 2019 and I would love if you would photograph it.” Well the short answer was yes and the long answer was, how are we going to pull this off? After some elaborate scheming, we convinced Laura that we just happened to be passing through Hunstville, Alabama (8 hours from Jacksonville haha!) and that we saw she was going to be in town too. We planned a hike together and spent the walk catching up and silently freaking out because she had no clue. After the proposal, Tom’s parents, sister, and cousin climbed down into the cave and Laura was shocked all over again. There were so many good feelings, and smiles, and we were so happy to not only photograph in but to be a part of the joy. We all explored the cave and then went home for a fun champagne toast! !